Meet our crew: 11 passionate professionals that make your stay unforgettable and make you feel at home on board of Seven Sins. 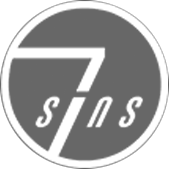 Seven Sins complies with the British Maritime and Coastguard Agency regulations for charter vessels, (MCA code) a guarantee for the safety of her guests. Captain Owain is from a small fishing village in North Wales and has been in yachting for 12 years.Owain has worked on a variety of charter and private yachts and has a sound knowledge of cruising areas around the Mediterranean and Caribbean. He is from a seafaring family so has salt water running through his veins. Owain is very proud of the experienced crew that he has working alongside him and will take every effort in ensuring your charter runs smoothly and efficiently to guarantee you the perfect trip every time. Sen is 37 years old and was born in Sri Lanka. He grew up with an immense fascination for ships and boats of all shapes and sizes, dedicated his whole life to learning as much as he possibly could about the ocean and the vessels which call it home. Sen spent many years on ships, completing various qualifications, travelled around the world 3 times with 15 Atlantic crossings and 10 Panama channel crossings. Ultimately, he completed his Maritime science degree in order to become an Officer. Sen enjoys working on yachts because of their beautiful destinations and high standards and looks forward to offering you the best possible time on board Seven Sins. Starting in the yachting industry at the young age of 18, Josh has 10 years of experience on yachts of various sizes, such as the 110m M/Y Dilbar, 70m M/Y Titan, and 62m M/Y Ocean Victory no name just a few. Before starting his career in yachting, he worked for two and a half years with his family on a new hotel venture as part of the management team for bar & food services. Joshua is a hardworking, reliable and multitasking team player who has a passion for watersports. Paul was born in The Philippines in 1995. He just started recently as our 2nd Deckhand. He developed his yachting skills during his previous embarkations, when he started 3 years ago. Paul always smiles and enjoys the yachting life. He is a very respectful crew member and works really hard to maintain the boat in her pristine condition. He is working his way to become an officer someday. Thomas is from New Zealand and grew up in a small town 2 hours from Auckland City. He has two years experience as a deckhand and is the senior RYA Jetski instructor on board Seven Sins. Thomas has always been into sports through out his life including rugby, boxing and squash so if you would like him to assist you with any exercise then let him know. His other hobbies include scuba diving, playing guitar and traveling. He looks forward to making your stay with Seven Sins fun and full of laughs. Karel was born in Belgium where his parents have a catering business. He graduated after 4 years of culinary school and decided to find his luck at sea. After 8 years working as Maître D on 2 Seabourn Ships and Restaurant Manager in the Queens Grill on the Queen Mary 2, Karel joined Seven Sins. He stayed on board for 4 ½ years and then took a short break, working for a private family in Belgium. He is now back on board Seven Sins to continue his career on Super Yachts. Karel enjoys all water sports and has a passion for good food and great wines. Nel was born in Belgium. After 3 years of training she graduated as a qualified nurse. In 1999 she entered the Cruise Line industry. She enjoyed fulfilling her roll as Assistant Housekeeper on Seabourn Spirit and the Queen Mary 2. During those years she trained and coached stewardesses in providing 5 star plus service. In 2005 she joined M/Y Seven Sins and stayed for 4 ½ years and she really enjoyed looking after the guests onboard. After a 2 ½ years break, working for a private family in Belgium, she decided to return to yachting. She loves flowers and enjoys looking after children, dining and food is a passion as well as good wines and reading a good book. He started working as sous-Chef by the age of eighteen and fourteen months later was Chef de Partie at the Michelin Star restaurant La Duree, an impressive achievement to say the least. Lowie loves to cook and loves the challenge of impressing guests with his tasty food and making them come back for more. He can be quite the entertainer. Very motivated in everything he does, when he is not in the galley, Lowie likes to free his mind at the gym or to ride his bike.